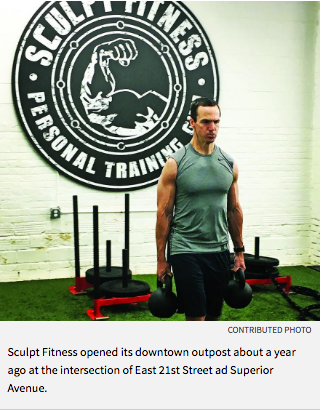 Sculpt Fitness owner Josh Dickey only needs to step outside his new downtown location at the corner of East 21st Street and Superior Avenue to realize he's in the right place. Within walking distance or a short drive from his year-old gym are restaurants, grocery stores and four residential buildings. "People down here see they're in proximity to work, food and fitness," said Dickey, whose boutique personal training facility celebrates its first anniversary in Cleveland on Aug. 1. "That's just the way people's minds work when they're downtown. As a small training business, I definitely see us as a big amenity." Sculpt Fitness opened its downtown outpost about a year ago at the intersection of East 21st Street ad Superior Avenue. Dickey is in good company these days, as the Cleveland downtown area has undergone a surge in new fitness- and wellness-related storefronts. Among the heart-pumping harvest is Inner Bliss Yoga Studio, Harness Cycle, Barre Fly and Orangetheory Fitness. Adding to the city's recent health kick are Cleveland Clinic's express care center on Euclid Avenue and MetroHealth's walk-in clinic at the Parker Hannifin Downtown YMCA. The cloudburst of new fitness retail is meeting the city's long-held dream of Cleveland as a walkable lifestyle destination, said gym owners and downtown observers interviewed by Crain's Cleveland Business. Sculpt Fitness provides its mostly young professional clientele with a mixture of core, cardio and strength workouts under the tutelage of two trainers. Owner Dickey has four additional locations, all in the suburbs, and felt he had enough brand cachet to bring his business to the urban core. His 2,600-square foot downtown space is packed most days with commuters and energetic 20-somethings living nearby. "Exercising among that (younger) group is a big topic of conversation for them," Dickey said. "Cleveland is becoming a really active city, so people want to match their workouts to their lifestyle." Tammy Lyons takes yoga to the masses through the Inner Bliss Yoga Studio and her Believe in CLE movement, which brings large-scale classes to public spaces such as the Cleveland Museum of Art and the rooftop at The 9. In December, Lyons opened a new 3,000-square foot studio at 1224 Huron Road in Playhouse Square, where a staff of 12 teachers conduct 30 Vinyasa-style yoga classes each week. Lyons's third Northeast Ohio location — she already has studios in Rocky River and Westlake — attracts 300 students weekly, most of them living, working or attending school downtown. "We have a small percentage of students who usually practice at our other locations, but love the idea of downtown being a destination," Lyons said. "They can practice, go to our store for a juice, then walk to the Arcade. They're getting the downtown experience." Lyons' focus since launch has been building a community of clientele who live or work near the studio. To that end, she is sitting down with young professional organizations, store owners and others committed to meeting the needs of downtown residents and workers. As part of her outreach plans, Lyons is coordinating off-site classes this summer at the Kimpton Scholfield Hotel and another on Public Square to celebrate International Yoga Day. Inner Bliss is also the official yoga provider for the Cleveland Indians. Attendance at the studio is solid, but that's not say there haven't been challenges. Parking, for one, in the area is not overly convenient, although street parking is available, and Inner Bliss is currently negotiating discounts with neighboring garages. "The biggest variable to being downtown over the suburbs has been parking," Lyons said. "We realize convenience is important." Ultimately, Lyons sees Inner Bliss as one small facet in a citywide effort to draw residents into Cleveland's burgeoning urban core. "Positively impacting downtown gets people to visit local restaurants, go to games and concerts, and engage with the city overall," Lyons said. "Long term we're building a community of people committed to spreading positive energy throughout the city." Seven new health and wellness storefronts have opened or started construction downtown in the last year, according to the Downtown Cleveland Alliance, the nonprofit that oversees maintenance, security and marketing of downtown. Michael Deemer, DCA's executive vice president of business development, said the influx of health and wellness facilities speaks directly to the growth of downtown's residential population. About 14,000 people live downtown, while rental unit occupancy rates have hovered above 95% for the past six years. A residential base comprised of health-conscious millennials accounts for the lion's share of Cleveland's workout industry upswing, noted Deemer. As urban living inherently involves an on-the-go lifestyle, more fitness entrepreneurs are taking notice. "Certain market segments are drawn downtown for the aspect of walking or using bike share," Deemer said. "Wellness businesses are a response to a growing office and residential population demanding these types of services." 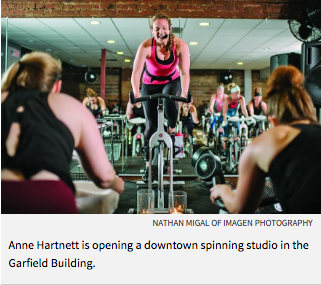 Downtown's promising future motivated Anne Hartnett to open a new cycling studio in the Garfield building at the intersection of East 6th Street and Euclid Avenue. Already finding success with her first Harness Cycle location in Cleveland's Hingetown neighborhood, Hartnett will introduce studio No. 2 with 35 stationary bikes, with room for expansion should demand warrant it. "The studio has room for 60 bikes," Hartnett said. "We'll be a small box studio that grows as residents continue to come downtown." In the run-up to her Labor Day grand opening, Hartnett is working with DCA, the local community development corporation, and a host of companies and property managers to share her business model and give out a free pass or two. Ideally, weaving Harness Cycle into the downtown tapestry will recreate the "all in" vibe Hartnett has found with her neighbors in the Hingetown area of Ohio City. Additional new workout studios and gyms can lend to that urban dynamism as well, she said. "Plugging into a healthy atmosphere of like-minded people is awesome," Hartnett said. "More studios opening will elevate all of us." Fitness clubs and other amenities are the natural evolution of a decade's worth of new downtown apartment and office space, said DCA's Deemer. Every new gym that opens points to a connected urban community that's steadily becoming Cleveland's strength. "These businesses are exciting because they allow residents and workers to go about an active lifestyle," Deemer said. "This (growth) reinforces that." Dickey of Sculpt Fitness is pumped to connect with a hustling network of professionals and city dwellers interested in his services. Business has been so good over the last 10 months that he's headhunting for at least two more trainers. "Cleveland is hot right now," Dickey said. "If you're a young business owner, the city is the place you want to be."